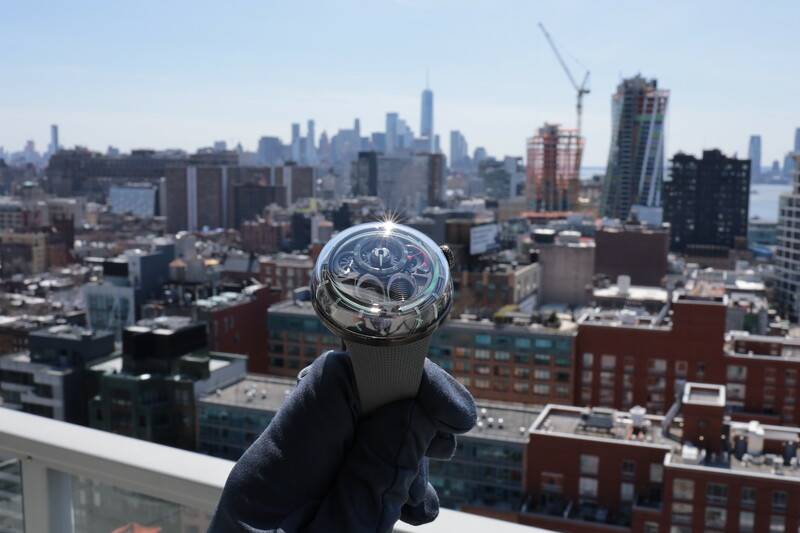 I have to admit when Jason gave me the Bovet 19Thirty to review I didn’t know what to expect. Having never spent any considerable time with Bovet and their lines, I made it my duty to find out as much as possible about this very old brand. What I found was actually fascinating, the brand was founded in London by Edouard Bovet in 1822. In the beginning, Bovet focused the efforts of his company on producing watches for a booming Chinese market. At the time, London was the perfect shipping port for sending goods to China. Eventually, demand exceeded the capabilities of their small London-based manufacture and the company started purchasing parts from Swiss manufacturers. Early on, Bovet produced mainly pocket watches for the Chinese market, which was at the time beginning to appreciate the quality of a fine European made watch. After the opium wars, and because of heavy counterfeiting and competition, the Chinese market virtually collapsed. Through the next century, Bovet (the company) changed hands many times but continued to produce watches in a very limited capacity. Manufacturing ceased in 1950 and the brand went dormant. In 1989, Parmigiani Fleurier purchased the brand and trademarks. In 1990, Parmigiani sold the brand off to investors. It wasn’t until 1994 that the brand started picking up steam, and opened an office in Geneva. Finally, in 2001 Pascal Raffy purchased the brand and began to establish manufacturing facilities in Switzerland. Fast forward to today, Bovet Fleurier produces just under 2,000 watches a year and employs 150 people. What I find fascinating about Bovet is that nearly a third of the watches it produces are bespoke (made-to-order). After sorting through the brand history, I was impressed by the can-do attitude of their founder (Edouard) and his ability to break into new markets before the age of the internet (and even telephone!). Credit should be paid to Mr. Raffy who revived the brand and oversaw its successful return to the marketplace. 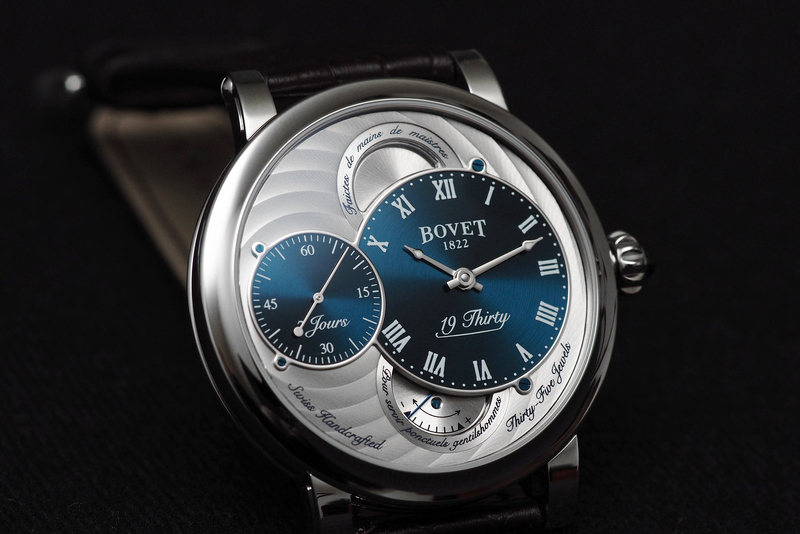 The 19Thirty line marks a new territory for the Bovet brand. In order to understand this new direction for Bovet, one must delve into their past. In the 1930s, watches began to evolve from pocket based objects into wrist-worn objects (i.e. pocket watches turned into wrist watches). Think of it as going from a beeper to a cell phone. Sure the beeper gave you the time and let you know when your parents wanted to get ahold of you, but it didn’t do much more than that. Once the mobile phone came out, we had a more accessible and more capable way of contacting the outside world. Wristwatch development was very similar to the cell phones of today in the sense of mobility. Pocket watches at the time were bulky, required daily winding, and because they were in your pocket or jacket, they required a few extra seconds to fiddle, find, and read the time. Once watches migrated to the wrist, owners instantly had a way to tell the time by simply glancing down to their wrists. The 19Thirty collection delivers a modern timepiece with connections to the past. The collection was inspired by vintage chronometers produced by Bovet before they moved into wristwatches. Another notable highlight is the usage of stainless steel for the base model 19thirty. Bovet has rarely ventured away from precious metals for their timepieces but succeeds here by delivering a high quality, immaculately finished steel piece with a great starting price for the brand. Bovet produces their dials in-house in a manufacture located in Plan-les-Rates right outside of Geneva. We were given a blue dial 19Thirty model to review. The blue dials have lovely circular brushed surfaces that really makes them pop. Moreover, they are easily readable under any light, enhanced by luminous material that is filled in the tips of the hour and minute hands. I think they did an excellent job. The dial plate is particularly distinctive thanks to the unique circular Cotes de Geneve finish which is the same decoration as seen on the bridges of the caliber 15BM04 movement, which is fully in view through the sapphire caseback, and unobstructed by a rotor as this is a manual wind watch. Further, the mainplate, visible on the back, has a perlage decoration, and all of the bridges are chamfered and polished. 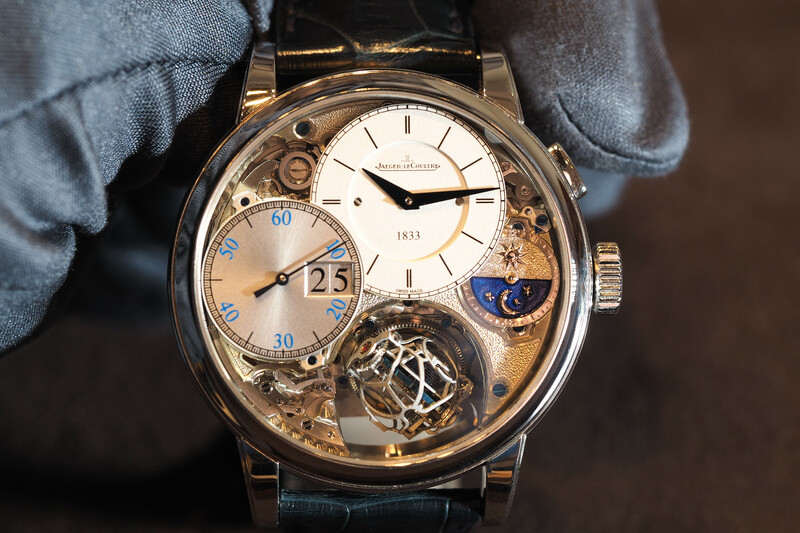 Blued screws finish off the traditional Swiss haute horology aesthetic. Impressively, the watch offers a week of autonomy (power reserve 168-hours), which is much appreciated in comparison to the 2-3 day power reserve typically seen on modern watches. Crafted of stainless steel, the in-house case on the 19Thirty is highly polished and felt silky smooth on the wrist. The push-in crown features the brand’s signature small sapphire blue cabochon jewel in the end. Water-resistance is 30 meters. 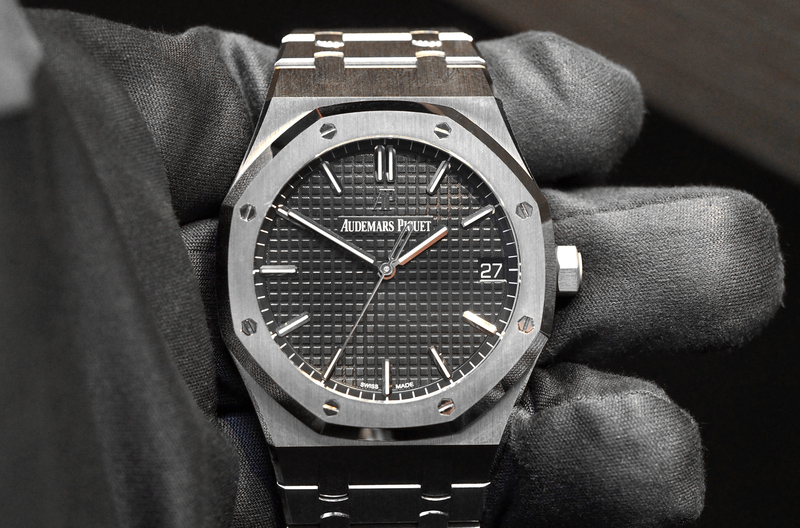 The case measures 42 mm in diameter x 9.6 mm in height x 48.10 mm in length. Width at the lugs is 20 mm. The strap is non-tapered, measuring 20 mm wide at the lugs and buckle. The strap features quick release spring bars for removal with no tool. Total weight with the strap is 65.5 grams, which results in excellent comfort on the wrist. I think Bovet knocked it out of the park with this one. I believe the 19Thirty line will be a tremendous success for the brand. At a starting price of $19,300 (clever huh?) for the stainless steel piece, these watches deliver on Bovet’s history, while not totally breaking the bank for the collectors of fine timepieces. I had a hard time giving this watch back after review.